Vienna, October 2012 – ‘You, Planet – An Exploration in 3D‘ is a spectacular journey into the fascinating cosmos of the human body. Moreover, it is also the winner of a first prize at the Jackson Hole Science Media Awards. By choosing ‘You, Planet – An Exploration in 3D‘ as winner of the “Best Visualization“ award, the renowned international jury elevated the Terra Mater-production to sit alongside the most celebrated science documentaries in the world. The Jackson Hole Film Festival is the largest and most prestigious competition of its kind, focussing each alternating year on nature and science. Terra Mater Factual Studios’ CEO, Walter Köhler, comments, “By producing this film, we explored new pathways in terms of technology, aesthetics and storytelling. I am all the more pleased therefore that our courage was rewarded.“ For ‘You, Planet – An Exploration in 3D‘ the filmmakers used the latest research and state-of-the art imaging techniques, directly taken from the field of science. “Until now it hasn’t been possible to observe and portray bacteria, cells and microbes in such a perfect way. This new technology gave us the opportunity to visually capture these fascinating – and largely unexplored – processes on film”, says scriptwriter and director Martin Mészáros. “In addition, the innovative technical methods available to us made it possible to break new ground in storytelling”. 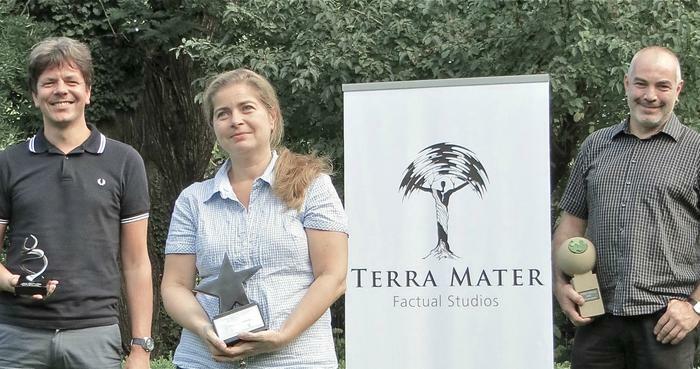 The Terra Mater Factual Studios production ‘Aurora – Fire in the Sky‘ also achieved great success at the biggest German Nature Film Festival, Greenscreen in Eckernförde. It won the award for best postproduction. The film, focussing on the polar lights, combines state-of-the art research on auroras with historical stories handed down by the indigenous people, who have been constant observers of this spectacle. “Beyond the scientific aspects of the polar lights and the fantastic capturing of the auroras, the visual re-imagining of the myths and legends makes this documentary something really special”, comments Walter Köhler. For the editor and graphic artist Jörg Achatz and his team, visualizing the selected legends of the four very different tribes, was quite a challenge in terms of creativity. But in the end, each of the animated scenes of the myths around polar lights had its own characteristic look – and its own charm. At once entertaining and informative, the “Aurora fairy tales” add real drama to the scientific content, each element uniquely complementing the other. The TMFS in-house production ‘The Neanderthals’ dark Secret‘ has also impressed an international jury at the US International Film & Video Awards and gained a SILVER SCREEN. The film revolves around on-going investigations into the past and reveals an extraordinary analyses of data found in a subterranean cave system called El Sidrón, located in the North of Spain. Director of the film, Ruth Berry, has accompanied the investigations from the outset. She has followed the excavation, the recording of the findings, the analyses and interpretation of the data in the specialist laboratory of the scientists. With spectacular images and featuring charismatic scientists and their latest research, she opens a gateway to the past and shines a new light upon the dark secret of the Neanderthals of El Sidrón. Find out more about the productions ‘You, Planet – An Exploration in 3D‘, ‘Aurora – Fire in the Sky‘ and ‘The Neanderthals’ dark Secret‘.